Eligibility: Open to all artists or design groups. No geographic requirements. Description The City of Alexandria, Virginia seeks to commission public art for the new Charles Houston Recreation Center. The process will be managed by the Office of the Arts, a division of the Department of Recreation, Parks and Cultural Activities, with the Alexandria Commission for the Arts Public Art Committee. The City will conduct the search for qualified applicants through a Request for Qualifications (RFQ). The art will be paid for by private donations. The purpose of the project is to honor and memorialize Charles Houston and to recognize the historical importance of the former Parker-Gray High School, Alexandria’s first African-American high school. Charles Hamilton Houston was a nationally-known civil rights leader and NAACP attorney who fought for equality in public education. He became involved with Alexandria when, in 1941, a group of concerned citizens began to petition for a new school and eventually appealed to the NAACP for assistance. Houston took on this challenge and used his knowledge and influence to aid the community in their fight. Their efforts were successful and a new Parker-Gray High School was built in 1950. When Charles Houston passed away one month before the school was dedicated, the community requested that the former Parker-Gray School be renamed the Charles Houston Elementary School in recognition of his important contribution. Years later, the school was demolished and a recreation facility was built that retained the Houston name. This building was later razed to make room for the new, state-of-the-art Charles Houston Recreation Center which opened in February of 2009. When plans for the new facility began, the community indicated their interest in seeking an appropriate way to not only memorialize Houston and his contributions to Alexandria but to also find a way to preserve the history of the Parker-Gray schools. The project's overarching theme is Education and Civil Rights. Process: Three finalists will be invited to submit proposals. Each will receive a $2,000 honorarium. Web Site: http://alexandriava.gov/arts - click on Charles Houston Public Art Project. Artists or design teams interested in applying to the Request for Qualifications (RFQ) are encouraged to register with the City of Alexandria's e-procure system located online here. All inquires regarding the RFQ should be directed to Dominic Lackey at the City of Alexandria Procurement Department. Questions may be sent by fax to 703.838.6493 or by email to dominic.lackey@alexandriava.gov. Please reference the solicitation number and title on the fax or email. For general question related to the solicitation, you may call Dominic at 703.838.4946, extension 600. A collection of Frida Kahlo oil paintings, diaries and archival material that is the subject of a book to be published by Princeton Architectural Press on 1 November has been denounced by scholars as a cache of fakes. 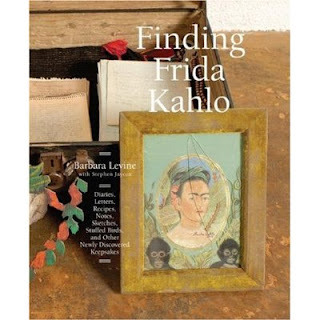 Finding Frida Kahlo includes reproductions of paintings, drawings and handwritten letters, diaries, notes, trinkets and other ephemera attributed to the artist. They belong to Carlos Noyola and Leticia Fernández, a couple who own the antique store La Buhardilla Antiquarios in San Miguel de Allende, Mexico. The publisher describes it as “an astonishing lost archive of one of the twentieth century's most revered artists...full of ardent desires, seething fury, and outrageous humor”. According to an interview in the forthcoming book, and to emails from Noyola to The Art Newspaper, the couple acquired the items incrementally from 2004-07 from a lawyer who in turn had acquired them from a woodcarver who allegedly received them from the artist. Noyola tells The Art Newspaper he has more than 1,200 Kahlo items in all. Read the story in AN here and check out the book here.